Much like the Critérium Du Dauphiné, the Tour de Suisse is a very good indicator of form for the Tour de France which begins in July. The favourites for the Tour will often race one or the other, with riders from the teams trying to showcase their ability for that coveted Tour slot. The 2015 Tour de Suisse was close all the way to the finish in Bern yesterday, with favourites like Katusha’s Špilak, Team Sky’s Geraint Thomas and FDJ’s Thibaut Pinot all vying for the GC win. The first stage’s 5.1km time trial around Risch-Rotkreuz was as much a test of sprint duration as it was time trialing, and it was Giant-Alpecin’s Tom Dumoulin that won the stage with a 2″ lead on Fabian Cancellara and beating former Hour Record holder Matthias Brändle into 3rd with a 4″ deficit. Stage 2 threw the race straight into the mountains around Risch-Rotkreuz with a 160km stage that had two category 1 and two category 2 climbs to contend with. Tom Dumoulin was able to keep his yellow jersey for another day after forming a leading group of chasers on the descent of the final climb that had seen Spilak, Astana’s Jacob Fuglsang, Thomas and Špilak go clear at the summit. Dumoulin formed a group that included 9 riders at the front of the race, including stage winner from Lampre Kristijan Durasek who attacked the group in the final kilometer to take the win. Dumoulin managed to keep his jersey again on stage 3 from Quinto to Olivone, although his leading margin was whittled down further. On a stage that started with a HC climb and then was flat until a category 2 climb towards the end of the race, finishing with a category 3 finish into Olivone. The race was altogether in the final kilometer when Orica-GreenEdge’s Esteban Chaves attacked the bunch. This stirred the group to life and caused them to work to bring Chaves back, which they did with 300m to go. Tinkoff-Saxo’s Peter Sagan stuck to the wheel of Katusha’s Daniel Moreno as Moreno launched his attack and followed him all the way to the finish, diving around him on the final few technical corners to beat Moreno in the uphill sprint to take the stage. Stage 4 from Flims to Schwarzenbach was another day filled with climbing with a category 2 climb to begin with followed by three category 3 climbs in a circuit around Schwarzenbach. Dumoulin managed to keep his leaders jersey for another day although at the end of the stage he was level on time with Peter Sagan. The day belonged to Michael Matthews and Orica-GreenEdge though as they marshaled their leader to victory as he out-sprinted Sagan. In the final 2km Orica were leading the peloton as Sagan grappled with Trek’s Jasper Stuyven for Matthew’s wheel but Matthews was too strong he beat Sagan comfortably in the final sprint. Stage 5 was a big GC stage and one that saw Dumoulin finally cede his lead in the race. The 193km stage from Unterterzen/Flumserberg – Sölden/Rettenbachgletscher included two HC climbs including one as a summit finish which saw the GC rear their heads. After reeling in the majority of the breakaway with just IAM Cycling’s Stefan Denifl left on the final climb, FDJ’s Thibaut Pinot attacked the peloton with just 2km to go until the finish. His sole attack was strong enough to distance the rest of the bunch and he was able to solo on until the finish, taking the yellow leaders jersey in the process. Other GC contenders managed to pace their efforts on the Queen stage to finish in good time, with Thomas finishing the stage 43″ behind Pinot putting him in second place in the GC, Spilak was third at 50″ and AG2R’s Domenico Pozzovivo – in his first race since crashing out of the Giro – fourth at 55″. The longest stage of the race, stage 6 from Wil SG to Biel/Biene and was 237km of riding. The stage profile only had one categorised climb but was still a lot of climbing and descending, and was perfectly suited to the winner Peter Sagan who took his second stage of the race. Despite Etixx-QuickStep controlling much of the final kilometers for Mark Cavendish, it was Sagan who got his line right and managed to beat everyone out of the final corner with 200m to go. Sagan out-sprinted Katusha’s Alexander Kristoff and Lotto-Soudal’s Jurgen Roelandts with ease to take the stage victory as Pinot maintained his lead in the race. Stage 7 was another contender for a sprint finish, with just three category 3 climbs to deal with on the 152km stage from Biel/Bienne to Dudingen. Kristoff took revenge for his loss on stage 6 by beating Sagan in the sprint on stage 7 as he opened his sprint early to create a significant gap to Sagan. Kristoff had spent time on the wheel of Sagan’s teammate Bennati and when he opened his sprint with 200m to go Sagan was caught behind Movistar’s Jose Rojas, allowing Kristoff to get a gap. Although Sagan managed to make up a lot of ground it wasn’t enough to overhaul the in-form Norwegian. Stage 8 was a 164km circuit around Bern that included three category 3 climbs as a 19 strong group of riders forme the day’s breakaway. The breakaway was destined for success on this stage and the GC teams were happy to let them go with no major threat’s to the GC involved. Astana’s Alexey Lutsenko attacked from the breakaway on the final climb with 20km to go and was joined by AG2R’s Jan Bakelants as the pair made a bid for the finish. As Team Sky and FDJ controlled the peloton to a group finish to protect their GC riders, Lutsenko was too strong for Bakelants to contend with took the stage win in a sprint for the line. Stage 9 was the final stage and one that had been touted by the organisers as the deciding factor in the race. It was a 38km individual time trial around one lap of the same route as stage 8, with the GC riders against the clock to win the race. The top 3 GC riders were seperated by a handful of seconds, with Pinot still in the race lead, Thomas “34 behind and Špilak 47” behind. Tom Dumoulin was again successful in the time trial, beating Cancellara by 19″ to take his stage win. But all eyes were focused on the three leaders, with Pinot losing time throughout the stage and Thomas and Špilak neck and neck for the majority. 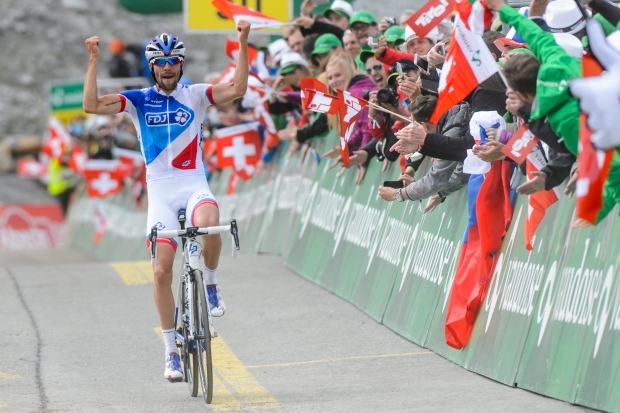 It was Špilak who managed to find something extra though to beat Thomas by 5″ and win his first Tour de Suisse.